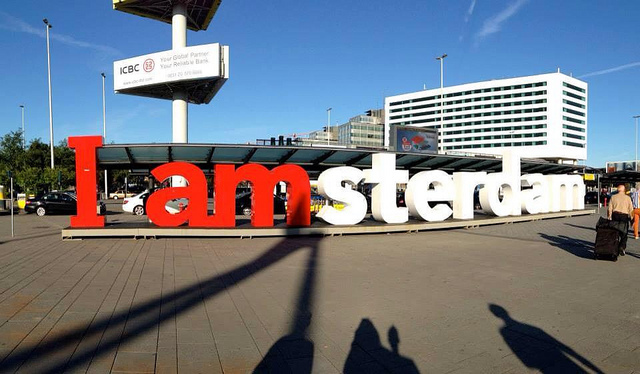 Delta Air Lines Flight Attendants’ quest for IAM representation arrived in Europe this week, as grassroots Delta Flight Attendant activists kicked off a week of organizing activities in Amsterdam, the Netherlands on Monday January 6, 2014. 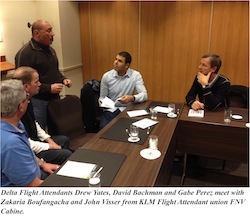 The week’s activities in Amsterdam will offer Delta Flight Attendants the chance to sign or renew their election authorization card and to learn more about the campaign and the benefits of union representation. 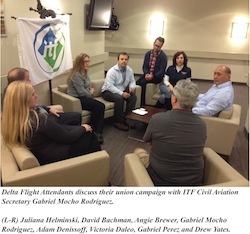 The IAM activists also met with the Secretary of the London-based International Transport Workers Federation and representatives from FNV Cabine, a Dutch union supporting their efforts that represents Flight Attendants at Delta code-share partner KLM. Find out more about the IAM Delta campaign at www.iamdelta.net. Submit a request for an “auto card“. Stay up to date with the latest campaign news by liking IAM Delta’s Facebook page.